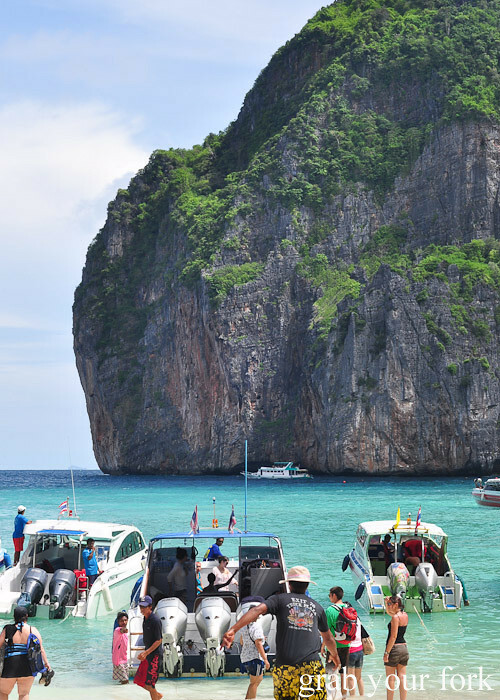 Our second island day trip from Phuket felt more like a cattle call as we were herded into groups, labeled with stickers and then hustled along to our waiting speedboat, ready to take us to Phi Phi Island. 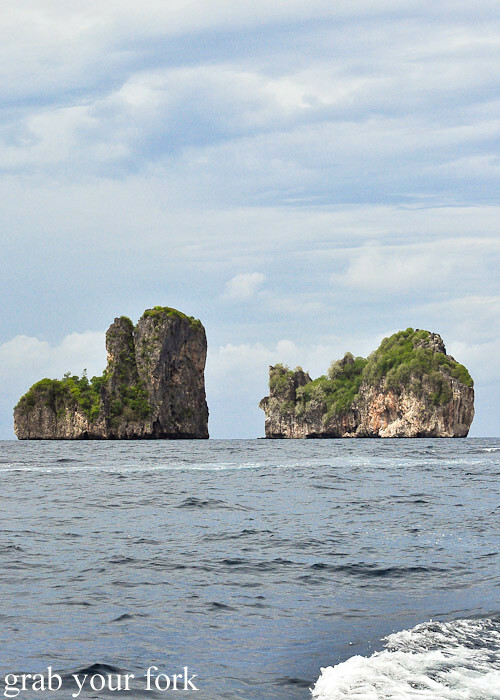 Our squawking guide was a stark contrast to the quiet start the day before, a tour to James Bond Island that included sea canoes and cave systems. 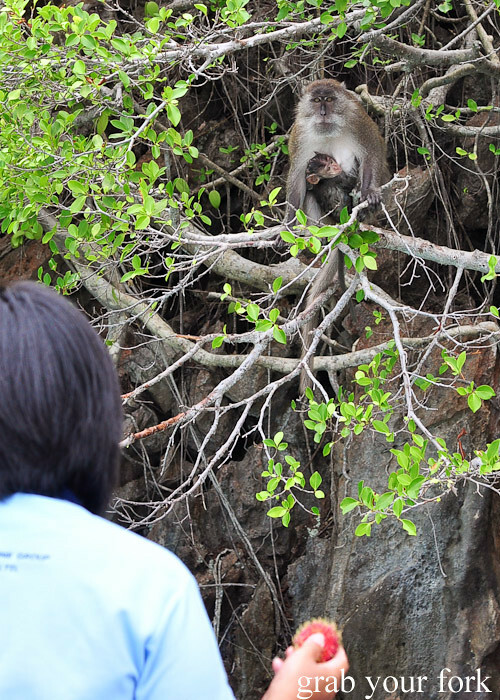 Today's tour with Phi Phi Eco Excursion felt more like a school trip, with a strict headmistress in charge. By the time we were out on the water, however, our worries melted like butter on a baked potato. 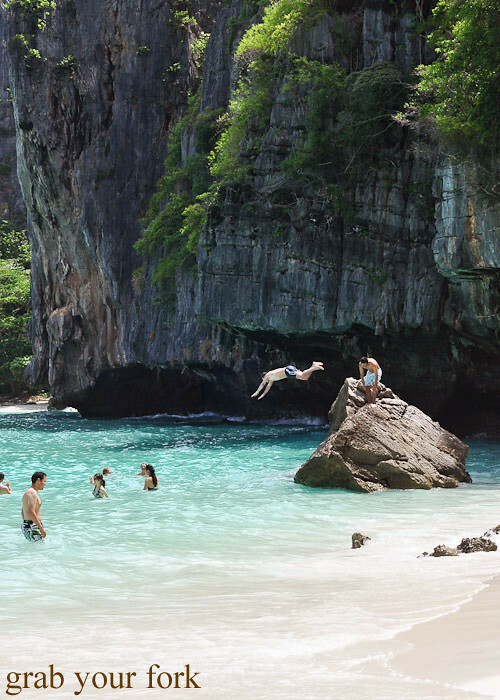 We sat back and reveled in the clear crystal blue water, soaring cliffs and glorious skies. At Pi Leh Bay we peeled off our T-shirts and jumped into the warm water in our swimmers, drifting about lazily as we floated on our backs. 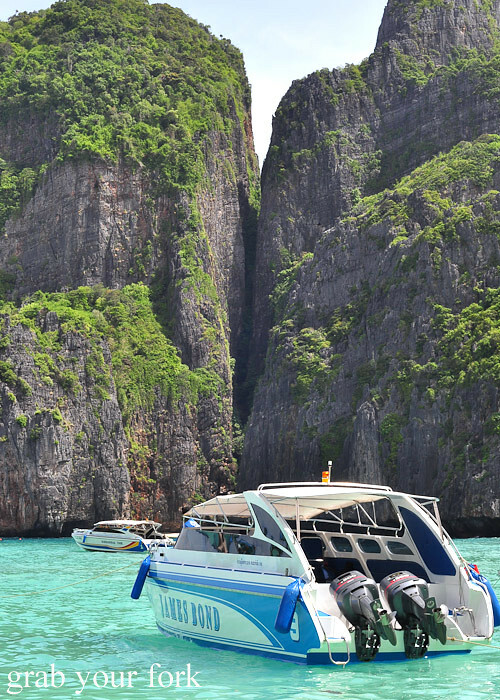 Our next stop was Maya Bay in Phi Phi Leh Island, famous for providing the breathtaking scenery in The Beach with Leonardo Dicaprio. 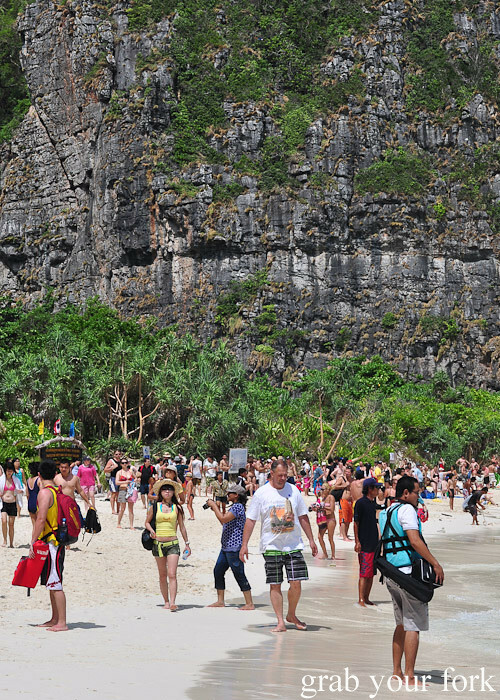 Of course any tourist attraction in Thailand is over-run with tourists. We made our way up to a beach that was swarming with people, everyone either holding a camera or posing for a photo. We shamelessly joined them. 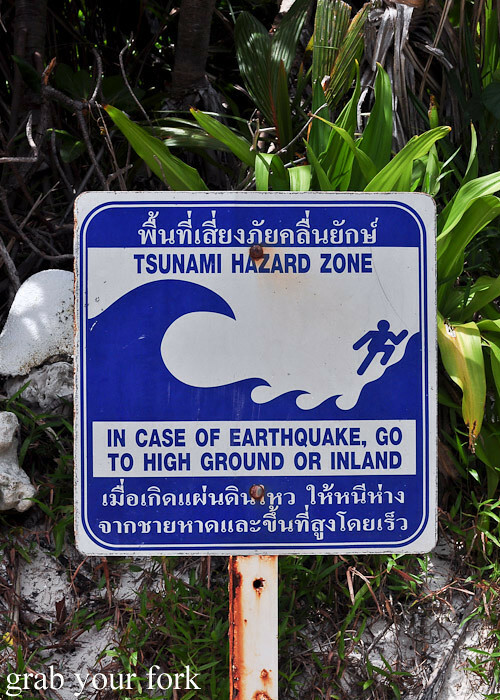 The tsunami warning sign on the beach a stark reminder of the devastating tsunami that hit the island on Boxing Day 2004. There have been suggestions that the tsunami did help regenerate the dunes that were damaged by producers during filming. 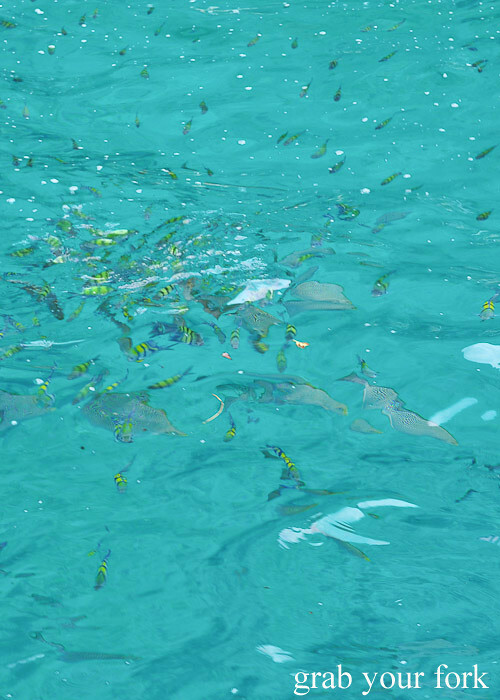 At Lo Samah Bay we snorkelled alongside schools of fish, darting flashes of colour that disappeared as soon as you got too close. 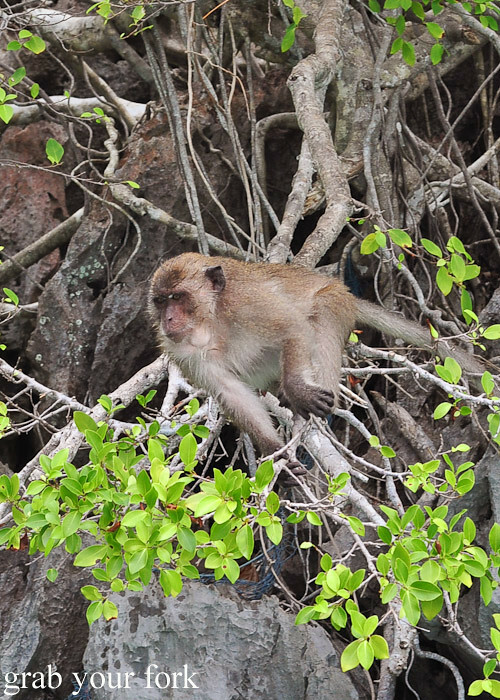 We stayed on board as our boat was guided toward Monkey Beach. 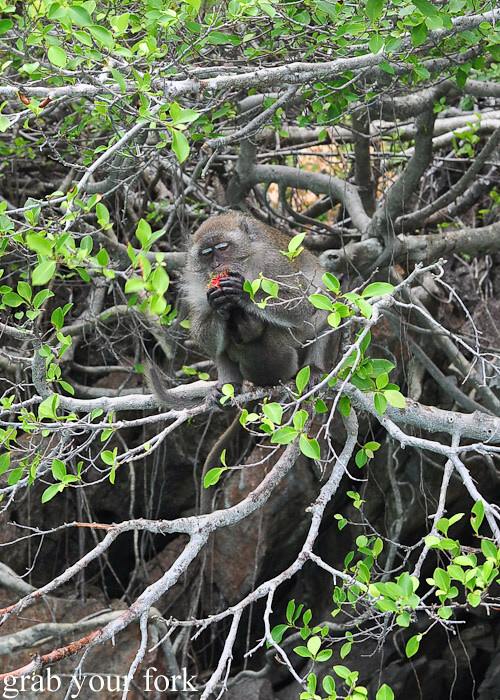 The local macaques at Monkey Beach in Yong Kasem Bay were treated to an afternoon snack of rambutans. 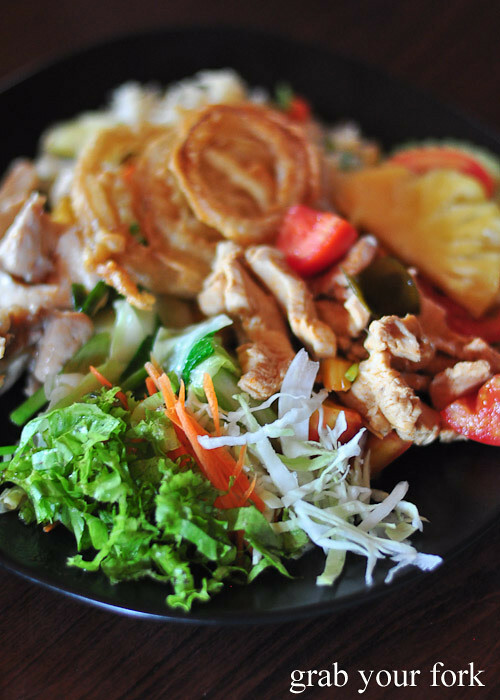 Lunch was an odd mix of Thai green curry, garden salad, fruit and onion rings. 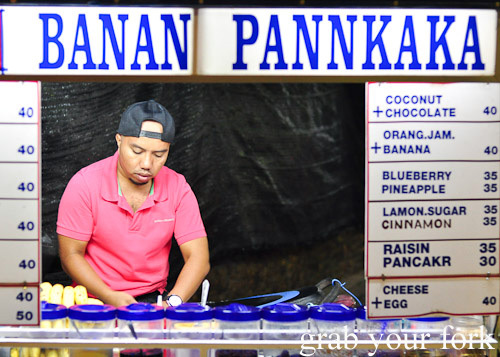 We had much more fun that night back at Phuket, bypassing the tourist trap restaurants and collecting our own makeshift dinner from the food stalls on the street. 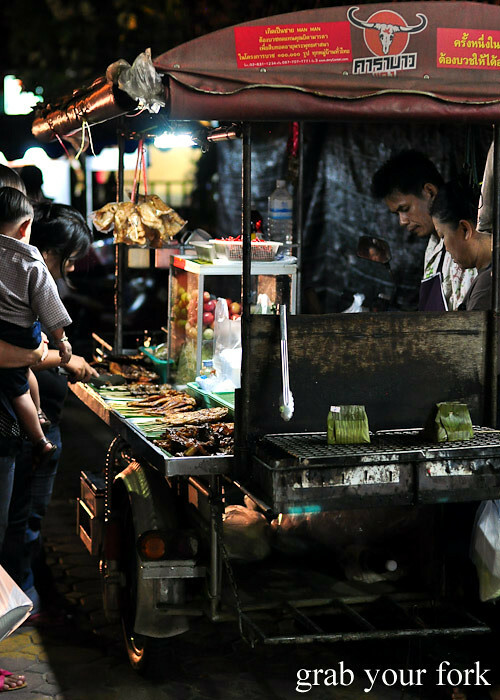 The street lights are few and far between in Phuket, but the street stalls are like beacons of hope, cloaked in plumes of smoke and stacked with all kinds of deliciousness. 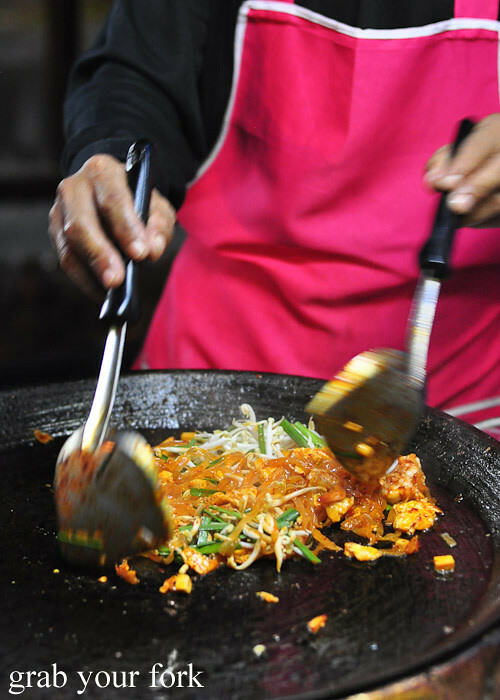 Eating street food is always a game of chance when you're traveling, but wise choices and some commonsense will usually keep you in good stead. I wasn't adventurous enough to gamble on the Hainan chicken (sorry Minh!) 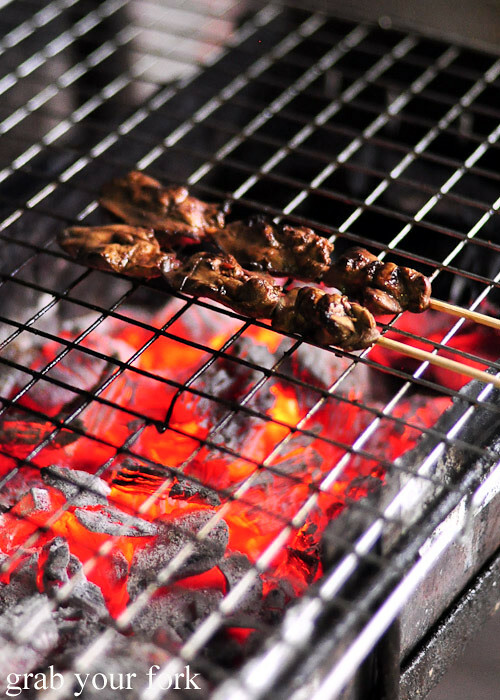 but we do load up at the barbecue grill, picking up skewers of chicken livers, chicken hearts and chicken giblets that are placed on the charcoal grill to re-heat. 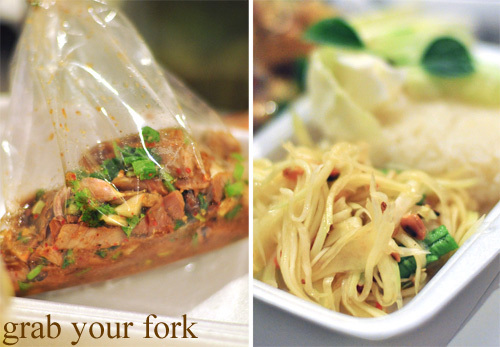 We add on a spicy grilled pork salad and a crunchy green papaya salad, both dressed to order and packed up in plastic bags for takeaway. 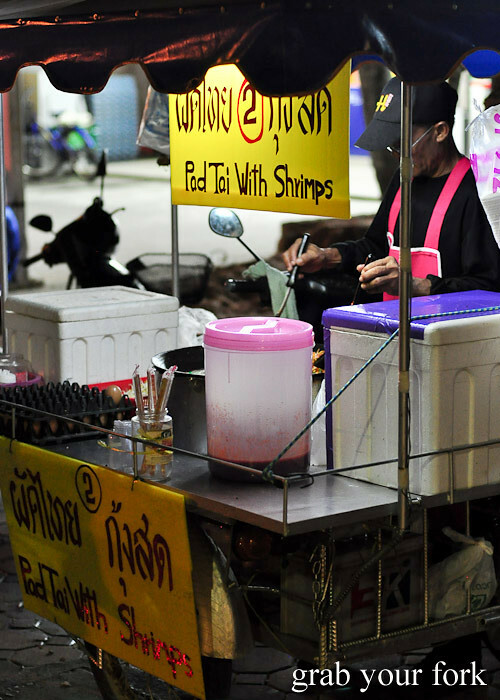 The next cart along sells Pad Thai. Perfect! The noodles are tossed through with fried egg, prawns, tofu, bean sprouts and garlic chives. It smells wondrous and when we dig into it back at our hotel, the noodles are perfectly sticky with sauce, with a little crunch from the scattering of crushed peanuts. And we can't end the night without dessert. We pick up two banana and Nutella pancakes, made from freshly stretched roti folded over banana slices and slathered with chocolate hazelnut spread. Dinner and dessert is sorted for 430 baht (about AU$14.80) between three - less than AU$5 each. Bargain! Ah! Finally get to see what I'd missed during my time away from you guys. 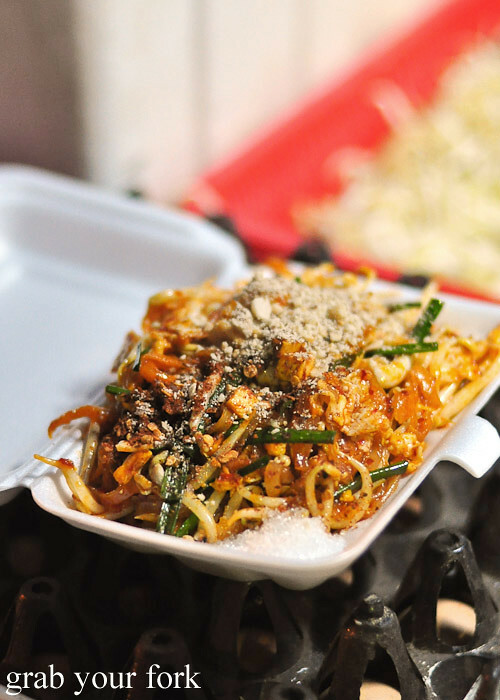 The pad Thai looks so good, it's giving me cravings. Oh Helen, we'll never know if that Hainan chicken was any good... we'll never know... But seriously, how awesome was that random stall? Wow, the waters are so blue!!! Mmm I love food metaphors and omg soo cheap!! Looks tasty as well! Oh Helen, I so wanna go there next!! Love Thai food... err, what am I saying... I love food!!! especially street style! aw i totes want to jump off that rock into the water! picture perfect beach! Awesome photos! 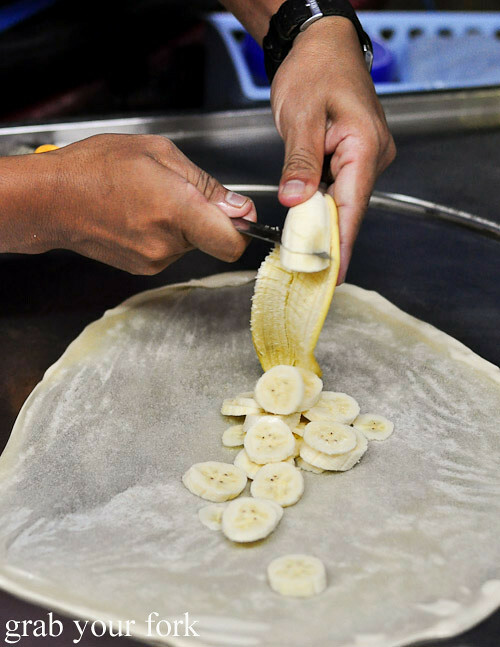 The banana and nutella pancake made from roti looks delicious! My biggest phobia... tourist central, although I'd go for the rockstar Pad Thai - come on Sydney we need street carts in our neighbourhoods. I would happily eat those livers. But not nutella liver pancakes. Never that. 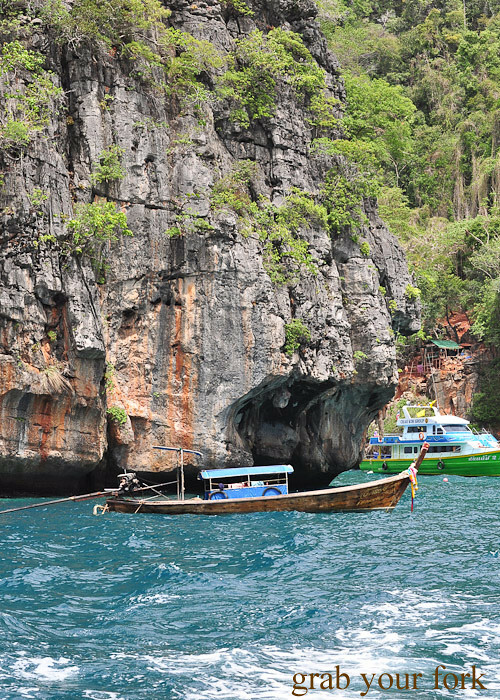 The closest I got to Maya Bay was scuba diving around it. Sadly the day we were there it was raining & lightning bolts were striking the water a few km away. Scary stuff, especially when we were 20m underwater! Much more pristine when you were there. And I say a big yes please to the banana & Nutella pancake! Aaahh!! That kid is so cute! 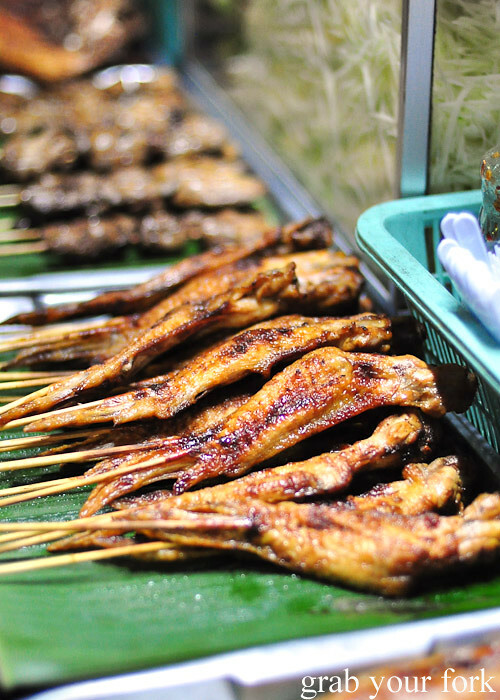 Looks like an amazing trip Helen- I couldn't get to Phi Phi as I get too boat sick and there were cyclones around when we were visiting- this looks amazing though and the food looks good too, especially those chicken wing skewers. P.S CONGRATS on being in the best new australian food writers - how very exciting for you. i want to go to thailand now... !!! It's amazing how many people visit that beach at the one time. We hired a boat ourselves and got to the beach and there was hardly anyone there and then all these boats started arriving with what seemed like a neverending group of people getting off. Oh my goodness- haven't been to Phi Phi since before the tsunami, but you've just made me put a return visit high on the list of priorities. Those photographs are just beautiful beyond belief. Great captures Helen-especially those night markets! They always have the best eating options! Oh my! Those are great photos you have there. 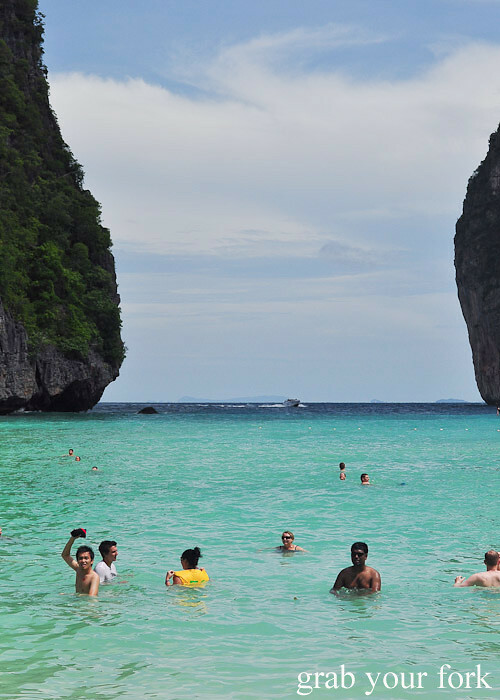 How I wish I could also go to Thailand someday. It seems to be a pretty awesome experience. That is just the most adorable stalker photo of the little boy. Wow look at all those people on the beach!